It’s happened again. That crazy English teacher of yours (the one who makes you write every day, expects you to focus on your work during class instead of making eyes at that cute guy at the next table, and knows what Wattpad is) has assigned yet another essay. Your hand is cramping at the very thought of breaking out another ream of notebook paper for the notes, outlines, and drafts she expects. Chances are, unless you attend school in a very tiny district three hours from the nearest cellphone signal, you have Internet access at your school, a computer lab or cart of laptops, and WiFi access. Your teachers may have asked you to use tools like Google Classroom and Docs to complete some activities. But did you know that you can harness these tools, plus more, to streamline your essay writing process? Take a look below at how you can integrate technology used by professional and novice writers around the world into each step of your writing process. Back in the day, English teachers required students to find resources in dusty reference books hidden in the back of the library, write information down on note cards, and then arrange those cards into some semblance of order before producing an outline. Today, you can replace those note cards with tools like Evernote, which is an online notebook that allows you to store information you find online, and even share it with other people. That’s where Evernote’s Web Clipper comes in handy. Install the web clipper into your browser (I use Chrome.) and when you find a page or even a PDF that you need to save, just click the elephant head-shaped icon on your tool bar, choose the notebook you’d like to save the page to, and give it a keyword or two. Click save, and your file is stored forever. That’s not even the best part. Let’s say you found a treasure trove of information on your computer last night, but now you’re at school, and all you have with you is your smart phone. Guess what? You can install Evernote on your phone and open up your notes right there. Nifty! 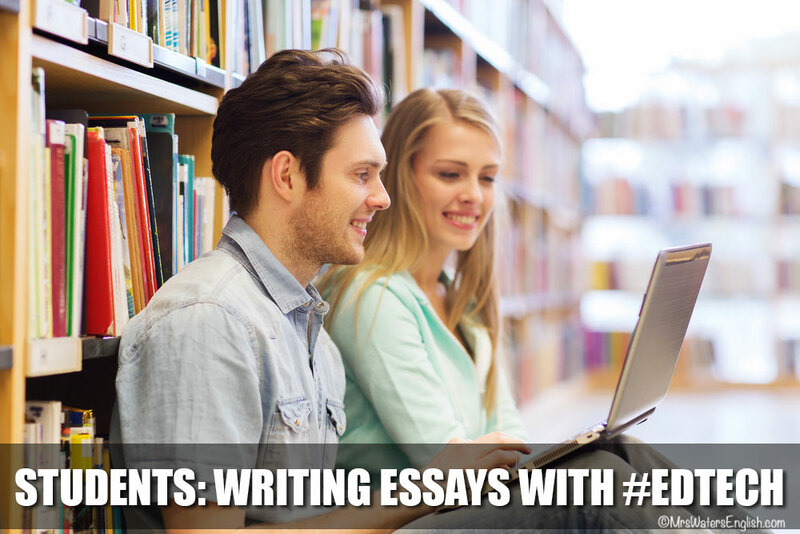 The templates and tips above will help you start out on the right foot to writing those types of essays, and you can also use an outline for a general five paragraph essay for just about any academic essay. (Although, I must say that you need to look at branching out from this basic essay framework.) Once you’ve organized your thoughts, and have an idea of where you want to begin (or which paragraph you want to start with), you can start drafting your essay. Google Doc’s usefulness doesn’t end with an outline or template. Generally speaking, once you’re ready to write your essay, just open a new Google Doc and start writing. Sometimes though, the process is a bit more complicated. For example, if you’re writing a research paper, you may need to use a very specific format, such as the MLA style commonly used to write papers and cite sources of information. Many students think that once they have their paper written, the work is done. This couldn’t be further from the truth. The two hardest parts of writing a paper are the prewriting — and the revising/editing. Those are also the most important parts, as the first will save you many precious hours from drafting and the latter will enable you to take the drivel you created during the drafting process and dig out the gold. When I was a newspaper reporter, I learned that two (or more) sets of eyes are always better than one. Once I wrote my news articles, I’d send them to my editor, who would read over them. Sometimes, she would ship the story back to me and make some suggestions. Other times, I’d lean over the front of her desk from my seat, and we’d talk through a particularly tough part of the story together. (Ahhh…I miss those days sometimes!) During my first semester working for the newspaper, as an intern, I felt I’d learned more about writing than I ever had. I could almost see myself growing as a writer. I want my students to be able to experience this, as well. For that reason, I teach my students to ask other people — peers, teachers, parents — to help them revise and edit their papers. This is where Google Docs really shines beyond the average word processor. Google has built in collaboration tools that enable you to share your document with someone else, who can then suggest edits and write comments. You can then accept the edits, converse with your collaborator via the comments, and generally make your paper much better than it would have been. Just this week, a high school student who is taking a college-level freshman composition class honored me with a request to review her essay. I was able to login to her document, suggest some minor grammatical changes, and comment on a couple of sentences that I thought needed to be rephrased for clarity. I was able to do this on my own time, and she was able to work with my recommendations on her own time. Now that you have your essay edited and ready for the world, you have a few options for publication. As recently as 5 years ago, most students who had an essay to publish had only one option: Print it out and hand it in to the teacher. Today, there are digital ways to manage the same process, and more options for those students who want to share their work beyond the classroom. But first, let’s start with turning in your work. This is my first year teaching in a school with Google Classroom, and I must say that, as a teacher, I am in love with this system. I could enumerate the reasons, but I’ll leave that for another post. My students love this system because they can login and view their assignments at any time and from any device. Additionally, they can easily turn their essays in via the Google Docs/Classroom interface. Turning your assignments in to your teacher doesn’t have to be the end of your project. What if you could find a wider audience for your writing? Not all students want to share their writing with the world, but for those who do, WordPress.com makes the process incredibily easy — and free. Just sign up, choose a blog name, a design, and start writing. Publication on your own blog can be particularly useful if you’re wanting to build a portfolio for consideration by college admissions officials, or if you have a cause to promote. For example, some of my students participate in rodeos. While bull riding, team roping, and barrel racing are not unique to Oklahoma, they are endemic to rural areas of the Western United States. As participants in rodeos, my students can be considered experts on how one gets involved in the sport and how to make improvements in one’s performance. These students can write their process type expository essays advising readers on how to improve their team roping skills, or how to train their barrel racing horses, then publish them on a blog for feedback from a wider audience. They can do this on their own, or with support from schools, who can assist in the moderation process. 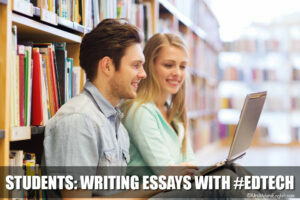 What other #edtech tools do you use to research, write and improve your essays?